Tutorial: how to start on Board Game Arena - FORUM KROSMASTER : Forum dedicated to discussions about Krosmaster. Share all your opinions, ideas and tactical tips! For many of you, Board Game Arena is a brand new website you're not accustomed to yet, therefore we created this little guide to help you start your first games. First of all, go to Board Game Arena and log in with your account. Start by clicking on the "Play" menu on top of your screen. 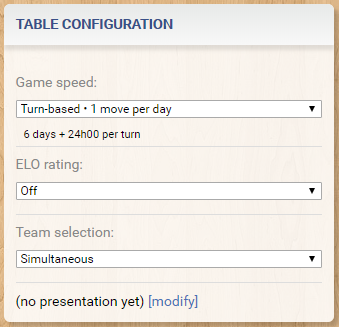 Select either Real Time (a complete game played from start to finish) or Turn-Based (a game spread over time in which players go one turn at a time). If you can't see the game on your page, you need to add "krosmaster arena" to your list of games. use the search bar below to do so. This will make the game part of your favorites, making this action unnecessary for future sessions. On this page, you can see open tables looking for a player, which you can join by clicking on them. If you want to create your own table (game), clic on the Play icon (a green triangle) next to the game's box. You will find there a configuration menu for your game, in which you can select the game's length as well as other options. Now, you have the choice between inviting a particular player to play with you, or just leave your table open. For the first case, you must select an opponent from your friends list or directly type in their nickname. If you desire to play against a random opponent, click on "Open table to other players" on top of the screen. In that case, any player who's looking for a table at that moment will be able to join your table. The game will start automatically once both players are ready. Have fun! As the beta became public, it is no longer necessary to be part of a group to see the game. The tutorial has been update as a result.